time: 50'35" + 52'29" + 1:15'02" + 1:12'36"
This retrospective set covers the band's classic years when Peter Gabriel was lead singer. The first two of the four discs consist of a previously unreleased live recording of The Lamb Lies Down on Broadway from 1975. Some of Peter Gabriel's vocals on the live recordings of this box set were re-recorded by the singer in 1995 due to technical problems with the recording as well as elaborate costumes that often muffled his voice. Guitarist Steve Hackett re-recorded some guitar parts as well. In addition, Genesis Archive 1967–75 includes some performances from an unreleased live concert from London's Rainbow Theatre in 1973, demos, rare B-sides and BBC Sessions in 1970. All 52 tracks (besides the last 3 on disc 3) had been previously unreleased. The entire set is arranged in reverse chronological order. 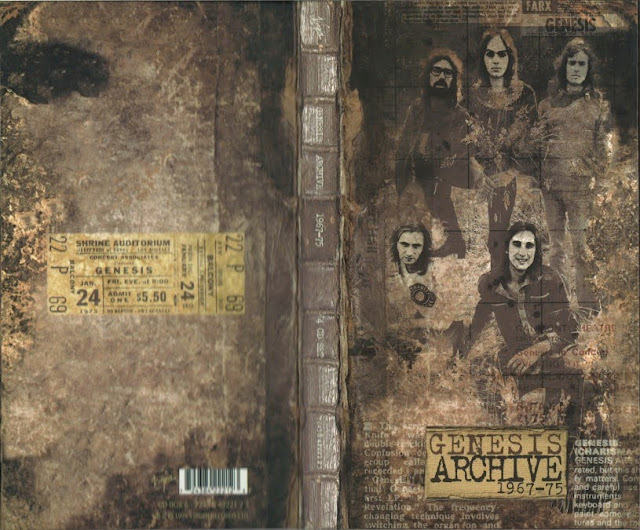 A well-received package, Genesis Archive 1967–75 reached #35 in the UK. All songs by Tony Banks/Phil Collins/Peter Gabriel/Steve Hackett/Mike Rutherford, except where noted. All of the above recordings were captured live at the Shrine Auditorium, Los Angeles, California on January 24, 1975. According to Nick Davis, about 40% of Gabriel's vocals were re-recorded, as was some of Steve Hackett's guitar work. Note: Not all credits for percussion/drums are listed in the booklet for Disc 4. On "Patricia" they are played by Peter Gabriel. Original drummer Chris Stewart is not listed, but likely plays percussion on all early 1968 demos.